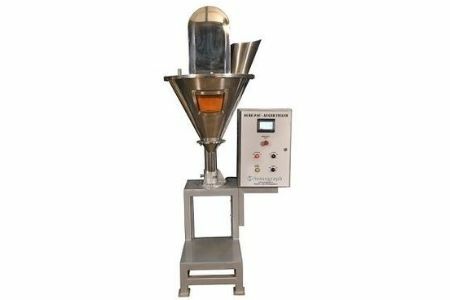 This packaging equipment uses screw drive to dispense the powder material such as wheat atta, rice atta , turmeric powder, chilli powder, spices etc. The ready pouch is kept below the screw on the platform provided in this packing machine. The continuous weighing of the material dispensed through the screw (filled into the pouch) is done & the feedback is given to the controller of the screw drive. The specially developed software for this packing equipment accurately controls the moment of the screw thus giving accurate weight. To pack all non free flowing powder items.